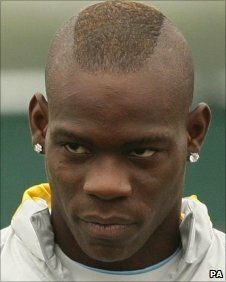 Mario Balotelli's Manchester City career has taken a new twist after it emerged he threw a dart at a youth team player several weeks ago. The 20-year-old was spoken to by club officials, but has so far escaped sanction over the training ground incident, in which no-one was hurt. City boss Roberto Mancini returns to Manchester on Tuesday, with the striker due back at the club later in the week. Balotelli has had a stop-start time since signing for £24m in the summer. He has missed a large chunk of the season because of injuries and a suspension, playing only 12 Premier League games. Most recently Balotelli apologised to his team-mates for the challenge that saw him sent off in the Europa League tie against Dynamo Kiev. The striker saw red after a recklessly high challenge on Goran Popov, as City won 1-0 but lost 2-1 on aggregate. Balotelli is currently in Italy and is expected to return to Manchester later this week. He was left out of coach Cesare Prandelli's squad for Tuesday's international friendly against Ukraine in Kiev. The forward, who has Ghanaian heritage, scored 28 goals in 86 appearances for Inter Milan after making his debut in December 2007. But he fell out with former manager Jose Mourinho last season and angered fans by allowing himself to be photographed in an AC Milan shirt.